The loss of a key partner has dealt a huge blow to Northern Dynasty Minerals' dreams of bringing the Pebble mine to life. Northern Dynasty Minerals (NYSEMKT:NAK) is trying to build a gold, silver, and copper mine. If it succeeds in its efforts, there's huge upside potential in the stock. If it fails, the shares will basically be worthless. It's a high-risk bet, and after the loss of a key partner, success looks increasingly less likely. There's an important lesson here, however, that all precious metals investors should take to heart. The size of the Pebble project is impressive. Northern Dynasty Minerals estimates that the proposed mine would hold 57 billion pounds of measured and indicated copper reserves, 70 million ounces of gold, 70 million pounds of molybdenum, and 344 million ounces of silver. According to the company, the Pebble Project holds the world's largest undeveloped reserves of copper and gold. The only mine with larger copper and gold reserves is the massive Grasberg mine in Indonesia. The problem is the location, which is in an environmentally sensitive part of Alaska. There's been considerable pushback from local residents, environmentalists, and local governments, noting that the mine would be located near a key salmon fishing region. The size of the opportunity, however, is very enticing. Which is why First Quantum Minerals agreed to help finance the project. Pebble is the only asset Northern Dynasty holds, so it has no revenue to support itself. Therefore in needs partners to provide the cash to bring Pebble to fruition. First Quantum was going to provide $150 million over four years for the right to buy a 50% stake in the Pebble project for $1.35 billion at a later date. The intended use of the $150 million was to get Northern Dynasty through the permitting phase of the project's development process. First Quantum nixed the deal in May because of the headwinds the project faces in getting approved. Not surprisingly, Northern Dynasty's stock has collapsed since First Quantum stepped away. To make matters worse, Northern Dynasty's auditors have hit it the company with a going concern notice, suggesting that there's a high risk of bankruptcy. There is huge opportunity at the Pebble Project based on the potential size of the mine, but there's also a huge risk here. If Northern Dynasty can't find another financial partner, there's a good chance that the Pebble Project will have to be mothballed. This is a lesson about the trade-off between risk and reward in the mining industry, especially when it comes to building new mines. Northern Dynasty isn't the first company to run into similar problems. For example, mining giant Barrick Gold (NYSE:GOLD) was excited by the opportunity to build the Pascua-Lama Mine straddling Argentina and Chile. The 21.3 million ounces of measured and indicated gold was the primary driver. But pushback from local citizens, environmental groups, and the government have made the mine uneconomical to develop, according to Barrick. The difference between Barrick and Northern Dynasty is that Barrick isn't reliant on just one mine project -- it has a profitable mining business to fall back on. Northern Dynasty only has Pebble. And at this point, Pebble looks like it's dead in the water. This, however, is where streaming company Wheaton Precious Metals (NYSE:WPM) and its peers Royal Gold (NASDAQ:RGLD) and Franco-Nevada (NYSE:FNV) come into play. Streaming companies provide cash up front to miners for the right to buy gold and silver in the future at reduced rates. Often miners use the money to build new mines. Wheaton provided $625 million in cash to Barrick for the development of Pascua-Lama. That is just one of 10 development projects in which Wheaton has invested. Its portfolio also contains 17 operating mines. So Wheaton provides diversified exposure to 10 development projects. If one doesn't work out, such as Pascua-Lama, it's not the end of the world. In fact, if Pascua-Lama never gets built, Barrick has to give the up-front money it received back to Wheaton. Barrick takes the biggest hit, even though it's easily strong enough to weather the pain of a failed mine. Franco-Nevada's portfolio of investments is not only large, but it is also diversified around the globe. Image source: Franco-Nevada Corporation. The real takeaway here, however, is that Northern Dynasty has one single shot at making it big, but Wheaton has 10 shots in play. And Wheaton is the least diversified of its major streaming peers. Royal Gold has 39 operating mines, 22 mines in development, and another 131 in pre-development stages. Franco-Nevada has 50 producing mines, 36 in development, and a huge 208 projects in the exploration phase in its portfolio of investments -- as well as energy investments in 57 operating oil and gas projects and 25 that are in the exploration phase. The size of the opportunity at Pebble suggests that it will, someday, get built. That, however, may not happen in time to save Northern Dynasty Minerals. 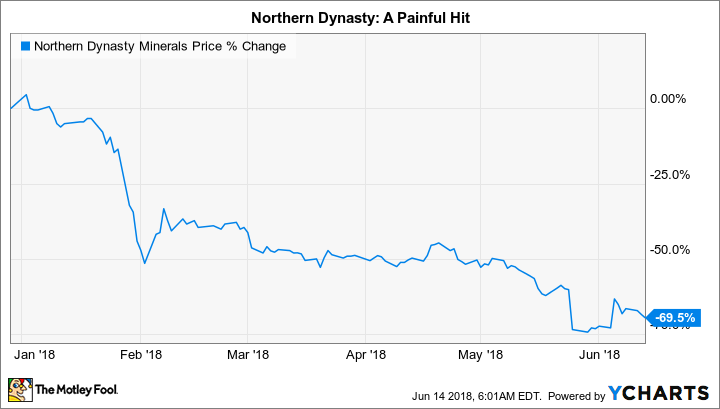 This a high-risk, high-reward situation that hasn't gone particularly well, and only very aggressive investors should own money-losing Northern Dynasty shares -- and only if the risks are carefully evaluated. If the excitement of a new mine is enticing to you, however, you'd be better off investing in a streaming company like Wheaton, Royal Gold, or Franco-Nevada, which all have diverse mine portfolios that include a notable number of development projects. Pascua-Lama proves that not all of these deals will work out as hoped, but with their investment eggs spread across multiple baskets, there's far less risk involved when things go wrong.